Can Dentists Give Sick Notes? An illness or injury can force you to pause your daily routine. If you break a limb, catch the flu or suffer from any other serious medical malady, you’ll likely need to avoid work for at least a few days. Even if your boss doesn’t necessarily want to grant you appropriate time off, most doctors will write a note on your behalf. But dental issues can be different. Many people — including patients and employers — underestimate how much a dental issue can impact your overall physical health. Getting a sick note from a dentist just isn’t something most people think about, but in many cases a note can help with overall recovery. Here’s an in-depth look at common dental issues which can keep you sidelined, how much recovery time is typically required and what activities you’ll need to limit. What Dental Issues Might Require a Dentist’s Note? Dental emergencies can occur without warning. If any of your teeth are knocked out of your mouth, either completely or partially, you want to act fast. Ideally, you should be seen by a dentist within 30 minutes after losing a tooth. Generally, you’ll probably want to leave work immediately to deal with any broken or missing teeth. Waiting until your shift is over, or for even just a few hours, can seriously impair the tooth’s ability to be successfully reinserted. Of course, leaving work early is often easier said than done. But delaying emergency care can result in permanent dental damage. Plus, early treatments are usually the cheapest option. In most cases, you’ll want to prioritize your long-term oral health. Your dentist will likely have no problem writing you a note to bring back to your employer. He or she can emphasize the need for fast treatment, and why leaving work was the best decision health-wise. Hopefully, a note can help alleviate any work-related problems. Except for routine cleanings, almost every other dental procedure will require at least some recovery time. Fortunately, unlike emergency care, you’ll have far more flexibility when scheduling routine procedures. You can take time off from work and otherwise plan for a recovery period. 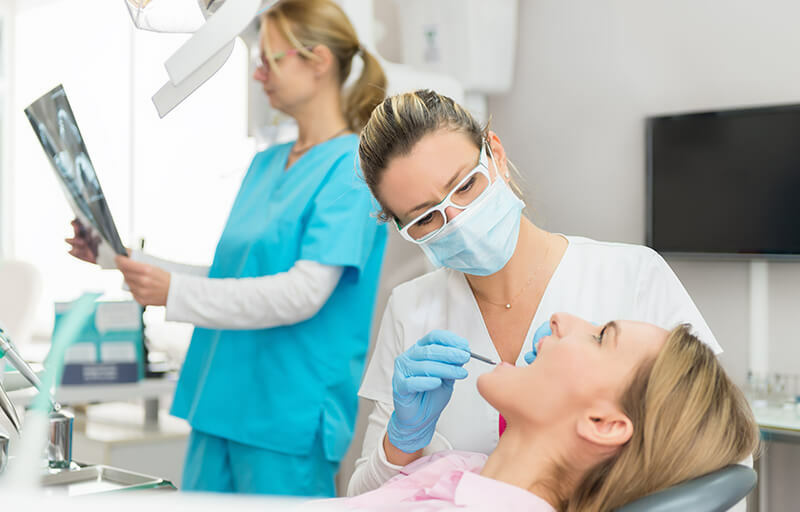 Most dental procedures are performed under either local or general anesthesia. Local anesthesia numbs just a small area of your mouth. You won’t feel anything while the dentist works, but you will be awake. If you’re anxious about the procedure, your dentist might administer a sedative. With sedation, you’ll be extremely relaxed and might not remember much of the process. General anesthesia renders you completely unconscious during the procedure — and you can remain impaired for over an hour after waking up. Regardless of what type of anesthetic is used, you’ll need a ride from the dentist’s office. If you’re required to take a sedative early in the morning (giving it time to take effect before the procedure begins), then you’ll also need a ride to the dentist’s office. With both general anesthesia and sedation, you’ll likely have difficulty just staying awake, so under no conditions should you drive home. But you should also avoid driving even after local anesthetic is used, as your ability to concentrate behind the wheel will likely be compromised. Plan to spend the rest of the day resting at home, even if you’ve just had a relatively mild procedure such as a deep cleaning. Beyond the first day, when you can return to work depends on what you do and what procedure was performed. Major dental procedures, like implants, typically require about three to five days of recovery. Most people won’t be able to work. General weariness, and possibly effects from prescribed painkillers, will limit your physical activity. Plus, a general inability to concentrate and talk clearly will likely limit your ability to perform even desk jobs. Plus, post-procedure care instructions are often easier to follow at home. You’ll likely need to change bandages, gargle with salt water and otherwise focus on recovery. Additionally, you’ll need to eat a special diet which focuses on soft foods instead of hard, crunchy ones. Generally, major dental procedures require a recovery time of three to five days while minor ones usually need one or two. Your dentist will be able to develop a more precise timeline based on your specific situation. Taking time off to recover from dental care is the best option for your oral health, but not always for your wallet. After all, time away from work often means a lower paycheck. However, skipping on the necessary recovery time can actually cost you money. If your gums and teeth aren’t allowed to heal properly, dental problems are more likely to develop later on, which means additional dental procedures and more time away from work. If you’re looking to save on dental care, consider a dental discount plan. While details vary based on the type of plan purchased, you can save between 10% and 60% on a huge variety of dental procedures and emergency treatments. Over 100,000 dental professionals nationwide accept dental plans. Available to use just a few days after enrollment, dental plan savings can give you a financial cushion which allows you to spend extra time away from work so you can properly recover.